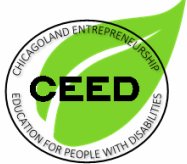 The Chicagoland Entrepreneurship Education for People with Disabilities (CEED) project is an interdisciplinary effort to help and support people with disabilities in pursuing entrepreneurship as a pathway to employment. Video: Why is entrepreneurship important? Forbes: Accenture, EY, Google, Microsoft And Other Leaders Find Great Value In Employees With Disabilities. By Paolo Gaudiano. Disability.gov Blog: The CEED Project: The Potential of Entrepreneurship. By Kate Caldwell, March 3, 2016. AUCD Best Practice Recommendation: Plain Language Summaries for Publications. By Kate Caldwell & Carli Friedman, Sept. 10, 2015.